NASA's Terra satellite captured Tropical Depression Roke over Hong Kong after it made landfall on July 23. On July 22, Tropical Depression 10W strengthened into Tropical Storm Roke and was located about 191 miles east of Hong Kong. At that time a Stand-by signal #1 was in force in Hong Kong. By July 23, Roke weakened back to a depression and move west-northwest toward the China coast. Maximum sustained winds had dropped to 30 knots (34 mph/55 kph) and warnings were dropped late in the day. The Joint Typhoon Warning Center issued their final advisory on July 23 at 0300 UTC (July 22 at 11 p.m. EDT). Roke made landfall at Sai Kung East Country Park on the Sai Kung Peninsula in Hong Kong. After landfall, NASA's Terra satellite captured this visible light image of Tropical Depression Roke on July 23. 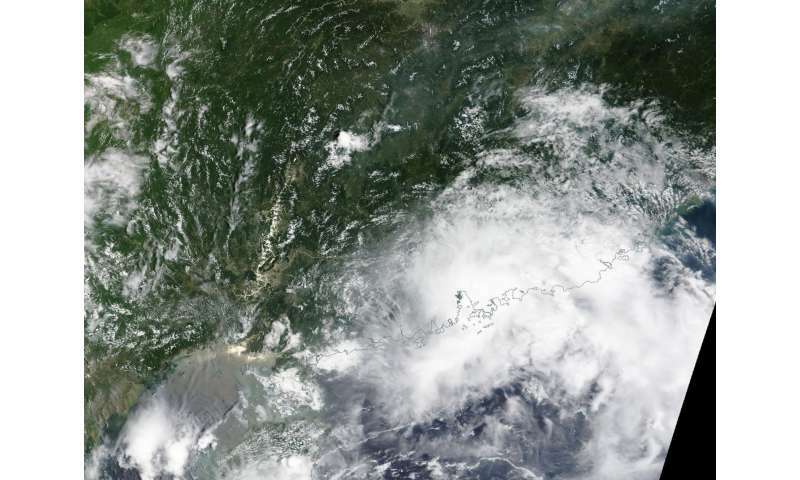 The image showed an elongated area of clouds and thunderstorms associated with the depression along the southeastern coast of China. The South China Morning Post reported that there were some ferries and flights disrupted, but there were no damages.